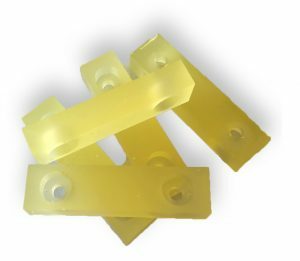 Urethane shock absorbers which can be used in industrial machinery applications, commercial aviation, electrical components and elevators are just some of the numerous specialty urethane applications that Plan Tech manufactures rubber shock absorbers for. Due to the expertise of our team of engineers as well as our utilization of the best raw materials available on the market, our shock absorbers boast unbeatable physical properties such as strength, vibration damping qualities, and excellent durability. Also, no other cast polyurethane manufacturer in the industry can boast of Shock Absorbers that offer better chemical resistance with the ability to disperse energy. We have rubber shock absorbers in a variety of shapes, sizes as well as hardness and our technicians who rank among the best the industry are very experienced and highly skilled in the act of casting shock absorbers that will meet your specific requirements. Do you have a sketch or sample of how you want your urethane shock absorbers to be designed? Then feel free to bring your idea to us and allow our experts to transform your imagination into the best shock absorbers you will find on the market that is customized to your application requirements. Like all of our custom urethane products, you can trust our rubber shock absorbers to continue to perform at its optimal best even after several years of performance in your application. Plan Tech also has an outstanding team of dedicated employees with exceptional talents designing and manufacturing urethane molded parts. We also are very proud of the “company we keep.” Our customers include many Fortune 500 companies, most of whom have been customers for 20+ years. Their drive to become industry leaders has helped us do the same. Whether you are a start up company or global leader, we can add value to your products with our strong engineering support, urethane polymer experience and constant focus on meeting all delivery requirements. Are you interested in cast Urethane Shock Absorbers? Please Contact us so we can help solve your requirements and work with you on your specific application!